Welcome older adults, family members, caregivers, and all who wish to further your knowledge and skills in living a healthier and higher quality life! You are invited to explore our educational resources and announcements. We continuously updating this repository and encourage you to visit regularly for new information. There are hundreds of Mobile Apps available to help those with Alzheimer’s disease and related dementias. Most are related to the management of those Persons with Dementia (PwD) already diagnosed, including “memory games,” incorporating music and art into their lives, and the importance of exercise and nutrition. What is lacking is an evidence-based App created by geriatric experts on the early identification of Alzheimer’s disease and managing the symptoms. 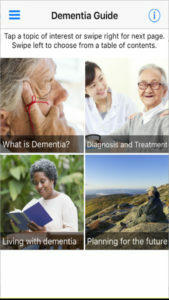 Our Dementia Guide Expert App provides evidence-based information on what is dementia, treatments/management, and links to national resources and support services. 2. Please feel free to check out our Free Consumer Education Program! Access and download our free health education learning modules. These modules were developed by our ENGAGE-IL Team and scholars and presented through our Community-campus Collaboration in Interprofessional Geriatrics (ENGAGE-IL-CCCIG) program. Older adult residents and caregivers were instrumental in selecting the holistic module topics and highlighting the benefit of interactive presentations. We encourage you to review these modules with your family members, caregivers, and/or friends and engage in discussion.